- PSN / SEN Enabled. - Ability to Downgrade from OFW 3.55 with QA activated. - Ability to downgrade from any custom firmware with QA activated. 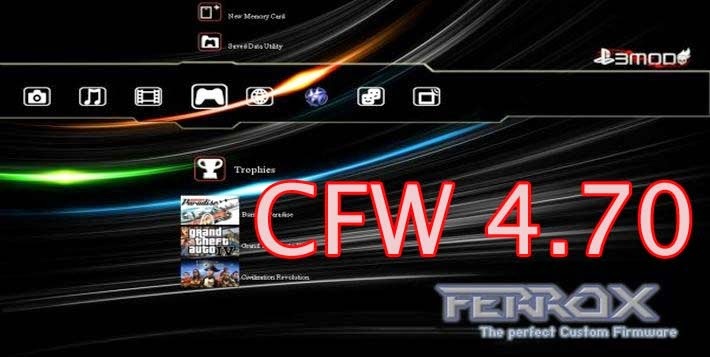 Including all Feature Standard Version Ferrox (viewable this TOPIC) CFW NoBd. Console can be installed on card with Logica Rotta. The homebrew and games will work again. CECHG04 - Tested and Working. CECHL-01A - Tested and Working. CECH-2501 - Tested and Working. CECH 2504A - Tested and Working. CECHC-04 - Tested and Working. I'm looking to downgrade to 3.55, my CECH is 2501A I'm currently running 4.70. Got the system on December 2010. came with 3.55 looking to downgrade back to that, do I just need a system restore to reset the system or what? March 4, 2015 at 1:06 PM delete This comment has been removed by the author. Es Posible de Downgrade, s Model. Work very good on ps3 model 40 gb serial no. CECHH01 the only thing is that i got black screen in some games like mortal kombat komplete edition,marvel ultimate alliance 2, little big planet 3 is there a way to fix black screen on multiman?